Cancer refers to the rapid, abnormal growth and multiplication of malignant body cells. Cancer has become a prevalent fatal disease and the stats are constantly on the rise. Among children as well, the occurrence of cancer is increasingly prevalent. 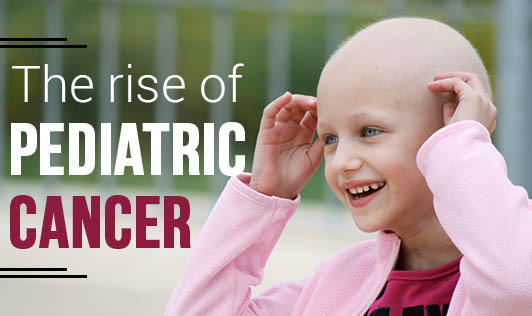 As per the Indian Council of Medical Research, 2.5% of the total cancer victims were children a decade back, while today the fraction has more than doubled to 5.5%. According to oncologists at the Rajiv Gandhi Cancer Institute and Research Centre, New Delhi, the primary cause for children having cancer is industrialization, technological advancements, and environmental depletion. Sudden alterations in the surrounding environment such as the result of the Bhopal gas tragedy, lead to several children, and even adults developing cancer. In case of developmental advancements such as industrialization and urbanization, the possible reasons for developing cancers can be due to daily exposures to several carcinogens such as food pesticides, polluted air, and toxic water sources. The most common forms of cancer encountered in children are leukemia and lymphoma. Since several causative factors are identified, it is not just important to take precautions in order to reduce potential exposure, but also identify symptoms, and get physician consults immediately. The most prominent indicator amongst other clinical manifestations of carcinoma is reduced immunity, reduced weight, and reduced appetite that gradually form a vicious cycle. This is termed as "cancer cachexia."